What makes obese cats prone to diabetes? That's one question researchers at the University of Calgary Faculty of Veterinary Medicine (UCVM) and the University of Saskatchewan Western College of Veterinary Medicine want to answer as they work to learn more about feline diabetes. The group of researchers has been working together for several years evaluating blood markers in cats and, more recently, evaluating tissues. "We're studying tissues of fat, lean and diabetic cats to better understand changes that occur with obesity and diabetes," says Dr. Chantal McMillan, who teaches small animal medicine at UCVM. 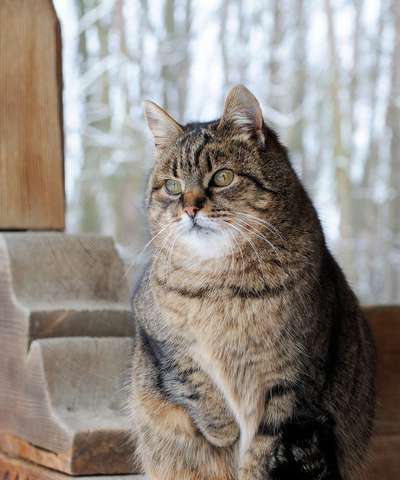 "Diabetes and obesity are two of the most common chronic diseases that cats develop." Unfortunately, many cats with diabetes go untreated because of the cost pet owners face and the intensive nature of the therapy. McMillan says cats and people have a lot in common when it comes to type 2 diabetes. For both, getting older and being overweight increases the risk of the disease. And for both cats and people with diabetes, there are fewer cells in the pancreas producing insulin and unwanted aggregates of proteins building up in the pancreas. In an earlier study, McMillan and her colleagues found that diabetic cats have greater concentrations of gastrointestinal hormones when compared to lean and overweight cats. These hormones help regulate normal blood sugar levels. Analogues of some of these hormones are used to treat people with type 2 diabetes and obesity. McMillan says little is known about these hormones in cats and that's something her group wants to learn more about. "We're trying to take it a step forward, to look at receptors for these hormones and other hormones involved in blood sugar regulation in tissues from pet cats that have been euthanized for other reasons. This may help us better understand if this therapy could play a beneficial role in diabetic cats," McMillan explains. "There are some real positives to that type of therapy, in that it promotes weight loss and it's really hard to get our diabetic feline patients to lose weight once they're on insulin. There could be some tremendous upsides if we can research it a bit further." McMillan adds that understanding the disease more precisely in a naturally occurring model is important. The researchers rely on donations of tissue from cats that have been euthanized. But while organ and tissue donation are widely accepted in the human population, they're less well-known when it comes to pets. "Our study certainly has benefited by veterinarians talking to the owners about tissue donation when they are sadly facing having to euthanize their pets" says McMillan. "Donation is not for everyone but for some people, knowing that after their pet passes away that their donated tissue might improve the health of cats in the future can be very comforting." Carbohydrates cause cancer, heart disease, obesity, liver disease and diabetes in carnivores. Cats are carnivores.